The Poogle is not a purebred dog. It is a cross between the Beagle and the Poodle. The best way to determine the temperament of a mixed breed is to look up all breeds in the cross and know you can get any combination of any of the characteristics found in either breed. Not all of these designer hybrid dogs being bred are 50% purebred to 50% purebred. It is very common for breeders to breed multi-generation crosses. "This is Abigail, a Poogle. She is the family dog (actually, she doesn't see herself as a dog, rather more like one of us). Her dad is a solid black Standard Poodle and mom is a standard size Beagle. In this picture, she's 5½months old and weighs 9 lbs. She has been very easy to train (sit, down, stay, etc. ), although housetraining has been touch and go. She lives for the reward and loves to ride in the car. Very loyal and loveable and sheds very little. In the last couple of months, her fur has gone through a transition from half-thick coarse and half-fuzzy to a new coat of thinner and longer hair. The hair parts down her back and she has the swirls on her back haunches as does the Beagle and she's full of tiny light-brown freckles. She's been a joy thus far; my boys and I couldn't imagine life without her!" Valentine the Poogle (Beagle / Poodle hybrid)—"We call her Vale for short. She was born on Valentine's Day. She is our family's first dog and has been fantastic. She is extremely smart and loves everybody. Her mother was a standard Beagle and her father was a white Poodle; she was the runt of the litter. This is a picture of her with her favorite toy, Otter. She is 6 years old in this picture." "Maggie the Poogle looks very much like a tricolor Poodle in the clean-face Poodle cut, but my husband prefers the fluffy look. Maggie was born almost totally black with a little brown around her eyes and paws. 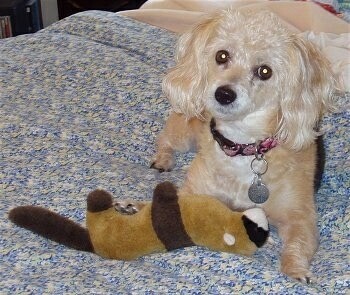 Her dad was a silver Miniature Poodle; her mom was a Beagle."